I know I had mentioned last week that I had planned on starting back to blogging about research and article reviews on Scoliosis. I had also made many other plans in my personal and professional life. However, as most of you know, the best laid plans have a way of getting sidelined. Today was our checkup with the Orthopedic Surgeon. Today, all of our plans changed. We were slated to have surgery on March 17th, with a straightforward thoracic fusion. Today we learned that in 4 months, our daughter’s curve has plummeted from a nasty 72 degrees to a pretty devastating 88 degrees. She must be hitting that infamous growth spurt with a fury. Not only that, but we found out that the cause of a mysterious pain in her rib hump area is actually due to some slightly fractured ribs. Possibly, her curve progressed quickly and her brace was pushing inward and contributed to fracturing those ribs. Nobody knows for sure. But, what we do know for sure is that all our plans are now going to change. And, now the surgery is going to be more complex, longer, and potentially not as effective as when she was at 72 degrees. We wanted to give her as much time to grow as possible, while fusing her spine before she hit her final growth spurt. Well, I guess we misjudged our window on that one! We wanted to have a great family vacation over Christmas break, a “last hurrah” of sorts before surgery, and we are going to have to postpone that. We wanted to wait until our daughter finished her short Middle School basketball season before she was laid up for a month or more, a sport she’s been working on all year. But, now we are looking at even having to cut that short. So, I guess we just keep on trucking. Our original plan was to have our checkups today, head out tomorrow for Fairfax, VA to get new braces made, then wait until March 17th for surgery. Now, we are faced with fractured ribs, the question of “do we wear the brace now or not” as we prepare to move the surgery date WAY forward. So, my husband suggested that, since I already arranged to have the kids out of school, that I go ahead and just take them somewhere fun for a few days, so that our daughter can get used to the idea of so many disappointments in a row. So, we are heading out with my sister to an indoor water park for a few days, and, while I am gone, I will get the new surgery date scheduled. So, when we get back, we will be ready to tackle whatever is in our path. My daughter is a total champ. “Let’s just get it DONE,” She said to me tonight. “And, then I’ll be totally ready to go next basketball season.” She also laughed when she found out her ribs were fractured (“Well, that explains it!”) So, I will be following her lead as we head forward, as she has already developed this remarkable sense of confidence and is blessed with a great attitude. She continues to inspire her Mom with her strength and courage. So, I may not be blogging as much – this is going to be a time of great chaos in our house, as I attempt to make all the pieces fit together for us in the next month or so. I may blog and just give a short synopsis of what is going on with us. My main concern, of course, is getting my daughter to this and through this. Thanks, everyone, for your support. Last week I talked about how my daughter is experiencing pain in her back for the first time. Well, a few days later, she started complaining about her brace – the piece that usually came up in front of her right shoulder, to keep it pushed back, was now barely reaching the top of her armpit! I couldn’t believe it! 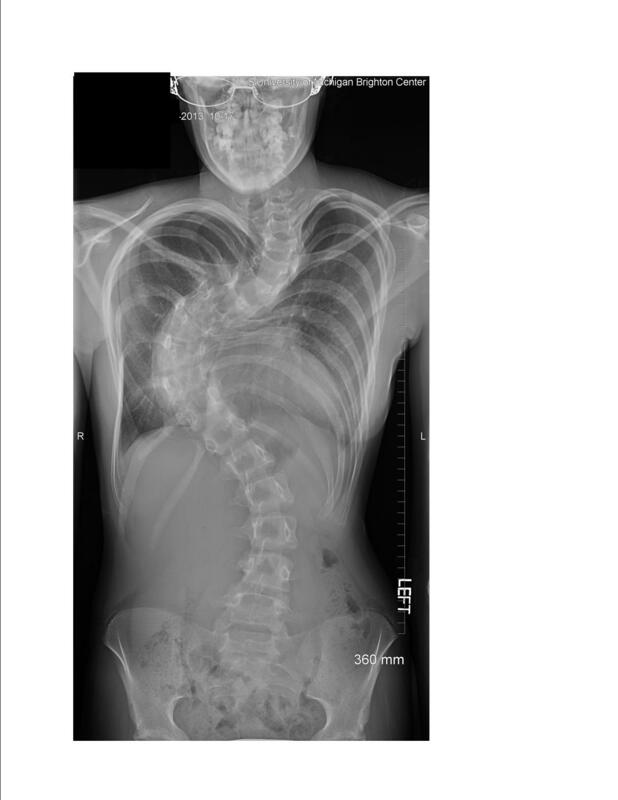 I had been trying to keep an eye on how her brace fit and figured that (per what our Doctor told us) she was nearly done growing in the torso region. I guess I was wrong. I was hoping that we could prolong needing a new brace until she has one made after surgery. But, clearly her brace is not fitting, and her posture is suffering, and her back is aching, and we need to make another adventure to Orthotic Solutions to get both of my kids new braces. My son’s brace has not been fitting ideally for a while, but we figured we could put him off because his curve has done so well, he doesn’t complain of discomfort in his brace, and he only wears it at night. We were going to wait until his sister needed a new brace, and now is the time. The only consolation is that we get to see our wonderful family that we stay with when visiting Orthotic Solutions AND we get to see Luke, which is great for all of us. Luke somehow managed to fit us in for November (please note: he usually books 6-8 weeks in advance), but we took advantage of a cancellation and got ourselves appointments. So, we will be hitting the road in mid-November for our annual brace trip. One more adventure. However, I was already scheduled for a Mom-only adventure this week. 7 months ago, I cashed in some frequent flier miles to get an off-peak ticket to see my best friend in St. Petersburg, FL. She and I have been friends since we were 10! 27 years of friendship, and 25 of them have been long-distance. I need to see her – it’s been too long. Yes, I plan to get some work done while down there (uninterrupted), but just to relax and BE with a good friend for a few days sounds wonderful. I do feel a little guilty – after all, my husband is here working, my kids are in school, I’m missing the last 2 volleyball games and a football game, and I have tons of work to do. But…sometimes we overworked Moms have to literally force ourselves on an adventure of our own so that we can fuel up for the rest of the year to come. I have a doozie of a year ahead. On the business side, things are great, but we have many big changes coming our way. On a personal side, we have our brace trip in Nov and surgery in March. It’s going to be a heck of a year! So, I’m taking my little Mom-only adventure and am going to do my best to swipe the guilt to the side and have a great time. I am fortunate that I have a VERY supportive family – and, besides, me leaving means that Grandma comes to stay, and EVERYBODY here LOVES it when Grandma comes to stay! A win-win overall, I guess. So, too many adventures? Nah – we can handle it – one adventure at a time. We have to enjoy the process of life, the greatest adventure of all. It started with her trying to perfect overhand serves in Volleyball. My daughter, who is strong after lifting weights all summer with her Dad, “pulled a little something” in her back and was a bit sore. It continued to escalate, until I came home last night to see her sitting upright in a chair, leaning on a heating pad, and wincing from any movement. Apparently volleyball practice was rough, then when she started to try and do her physical therapy, her muscles just seized up on her. I massaged her and rubbed on bio freeze (a highly recommended substance for back pain) and sent her to bed, but this morning she was still sore. I massaged her again, rubbed on bio freeze, and sent her to school, with the promise that she could call me if it got too painful. We skipped her morning Physical Therapy today and I said she could skip gym, but I haven’t had a call yet. I guess we should be grateful that we’ve gone this long without pain, but, when it does happen, it still really hurts – both of us! She is so strong, though, she amazes me every day – heck, I couldn’t even play volleyball, much less with a 70 degree curve in my spine! She handles it like a champ. But, we may have to stick to underhand serves until after she has recovered from surgery (there is always next season!). I am not sure. She won’t like that – she doesn’t like being held back at all, but sometimes one has to make concessions. So, please pray for my daughter today, that she gets relief and healing from her spasms, and that she can move on and enjoy her athletics. I have had so many of you reach out to me and tell me we are in your prayers (as you are mine) and it means the world to us. Thanks!